My friends and I visited Ginza Shimada the other day. 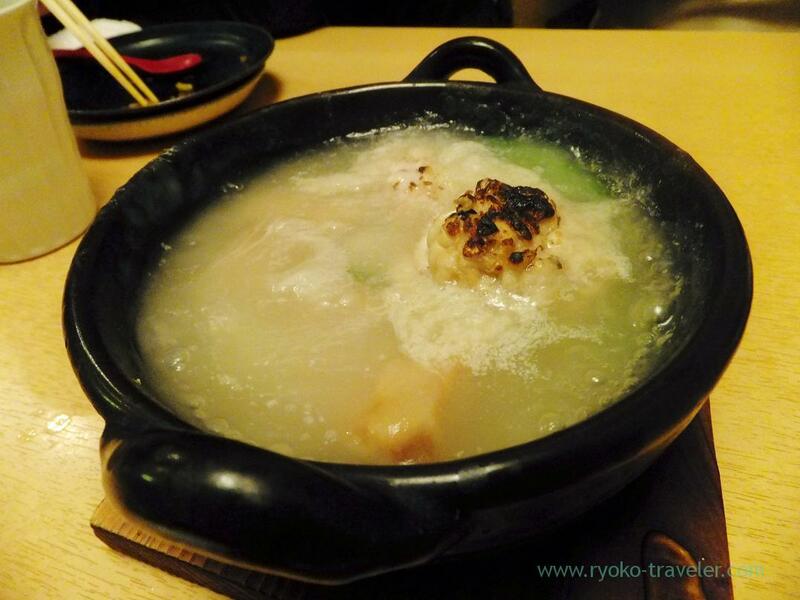 As its name, Ginza Shimada is located within Ginza area being a little distant from the busy street. 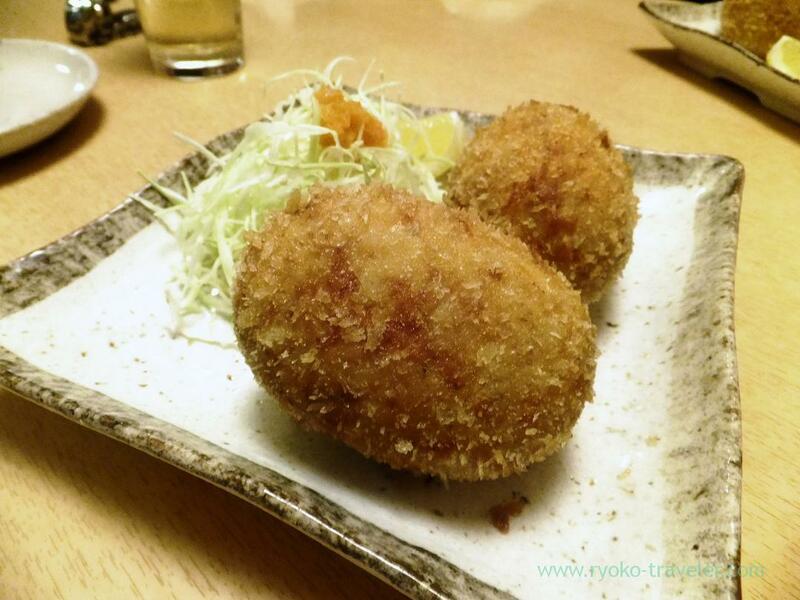 The appearance have fancy atmosphere of Japanese cuisine restaurant. But this house have no seats except four seats surrounding one table. And another, there’s only L-shaped counter table and there’s no seats along this table. Yes. This is not luxury Japanese cuisine restaurant. 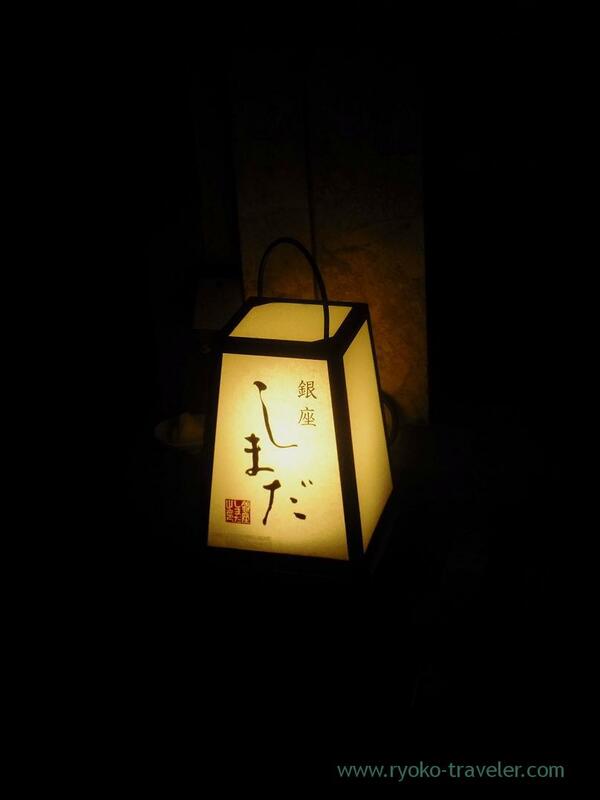 It is narrow and small stand-up-drinking izakaya. Basically, they don’t accept reservation in advance. But only the table having four seats can be reserved. So, you can imagine. Taking the reservation of this table is so difficult ! I said the table is for 4 person just now, but the table and the chairs are small, so there isn’t enough space to put our baggabes. We have no choice but place our baggages between the backrest of chairs and our backs by force. Or putting on the floor. But there also have few space to put our baggages on the floor. Why is Shimada is narrow like this ? Because. 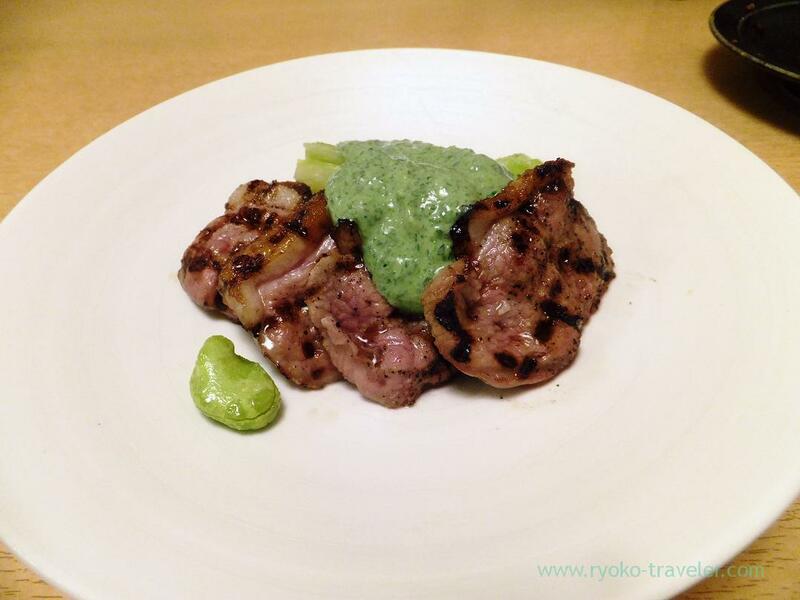 they save money for serving good dishes as good as Japanese high quality restaurants’ at cheaper prices. Shimada is managed by the campany that manage “Ore-no-Italian“, “Ore-no-French” etc. Though Shimada don’t have “Ore-no” on their name. There’re not large variety of drinks. 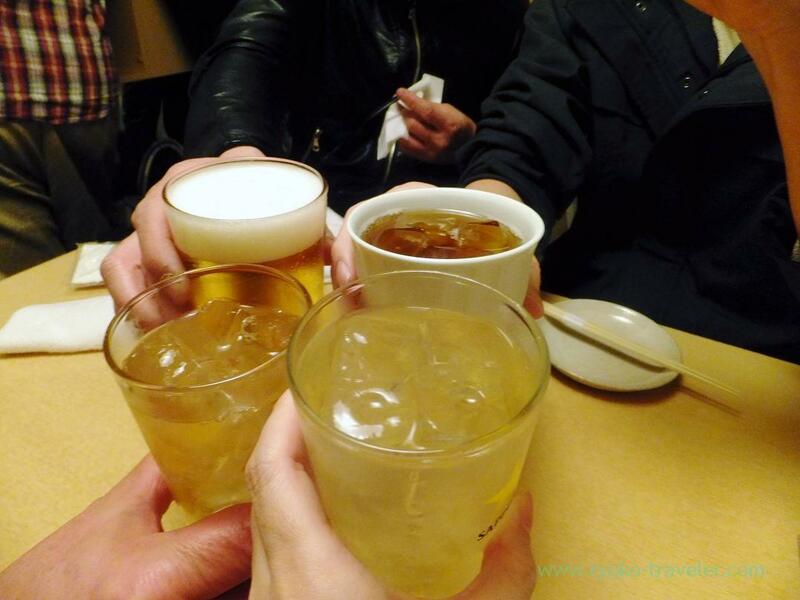 Beer, Japanese sake, Highball, Shochu, Plum liquor, oolong tea. That’s all. 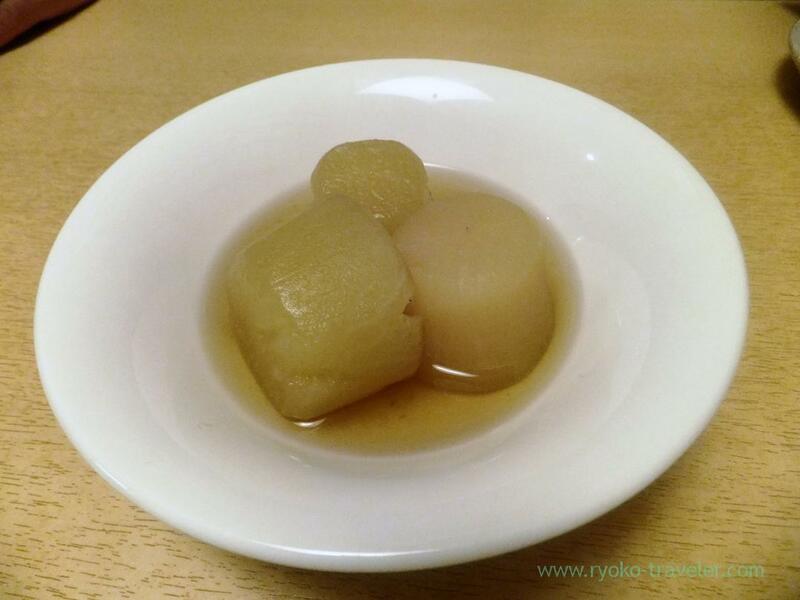 It’s very simple, but sommered soft daikon radish was like Kyoto-style oden. Of course, it was very good. Its also a simple one. 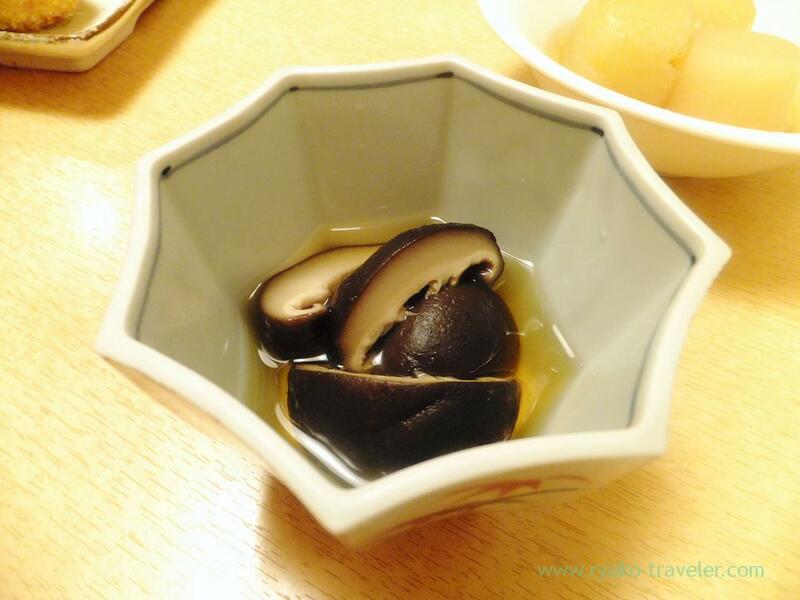 I love shiitake mushroom ! 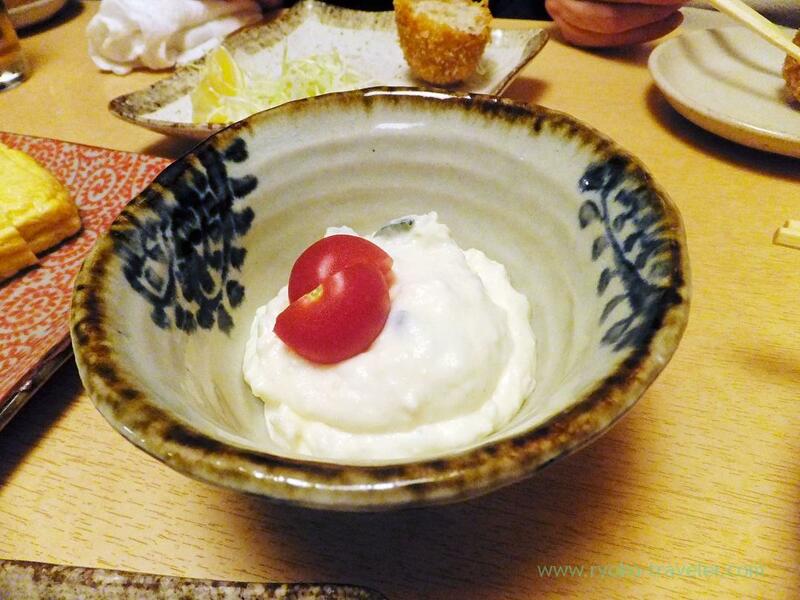 It is Tokushima’s local food. 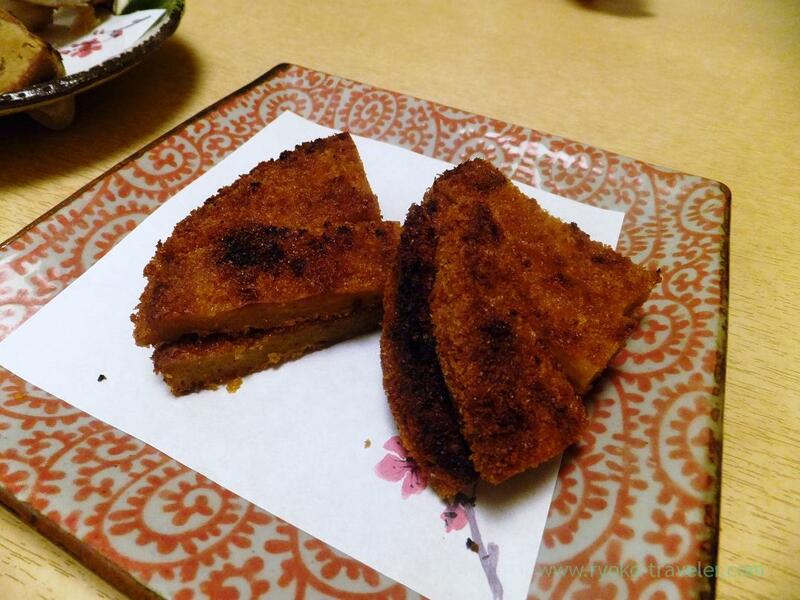 Deep fried minced fish cake dressed with curry powder. It’s spicy. 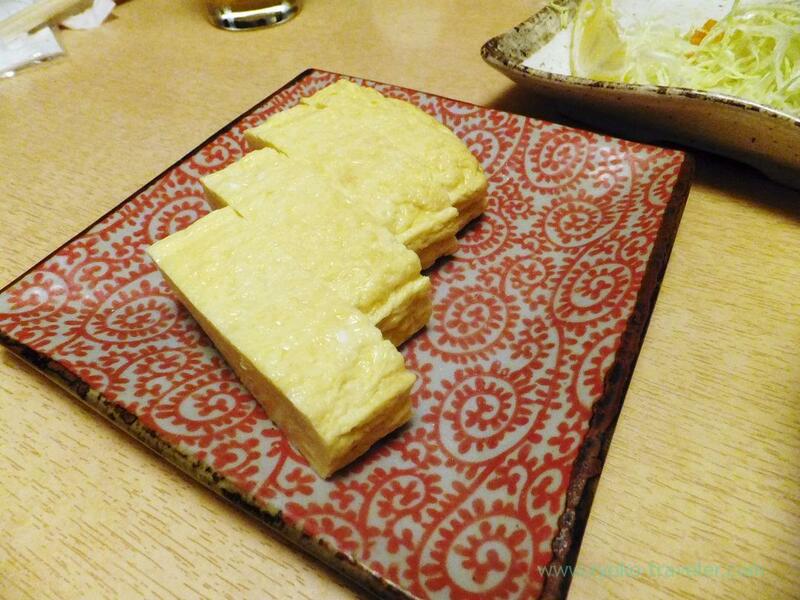 Dashimaki tamago is almost same as tamagoyaki. 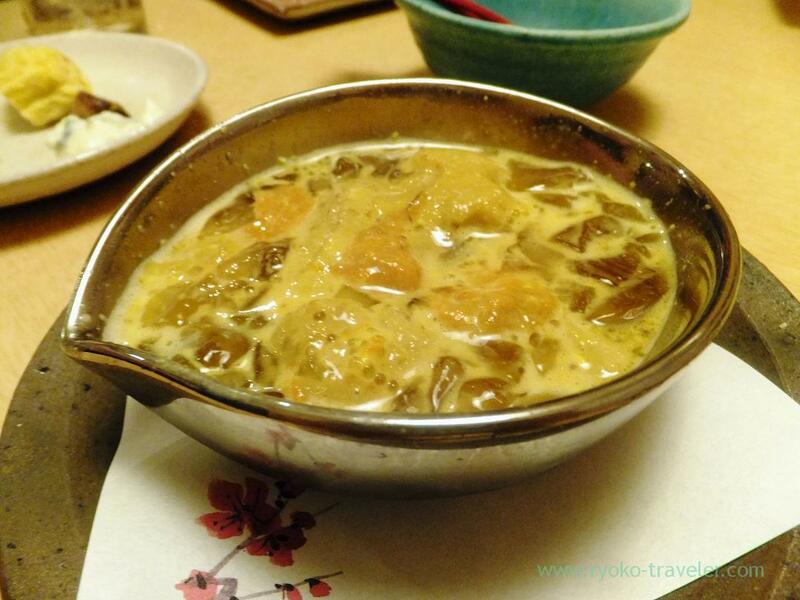 Only the difference is dashimaki tamago have fish soup stock. And the fish soup stock was really good. Herring is the taste of Spring. I forgot to take the picture of the section, but it had more snow crab’s meat than cream sauce. My mouth was full with the taste of snow crabs !!! I couldn’t take the picture well, actually, it is more nice orange-colored foods. It is delicious. It had full of spiny lobster taste ! It was Round tip of the beefmeat. The sauce is brown sauce. 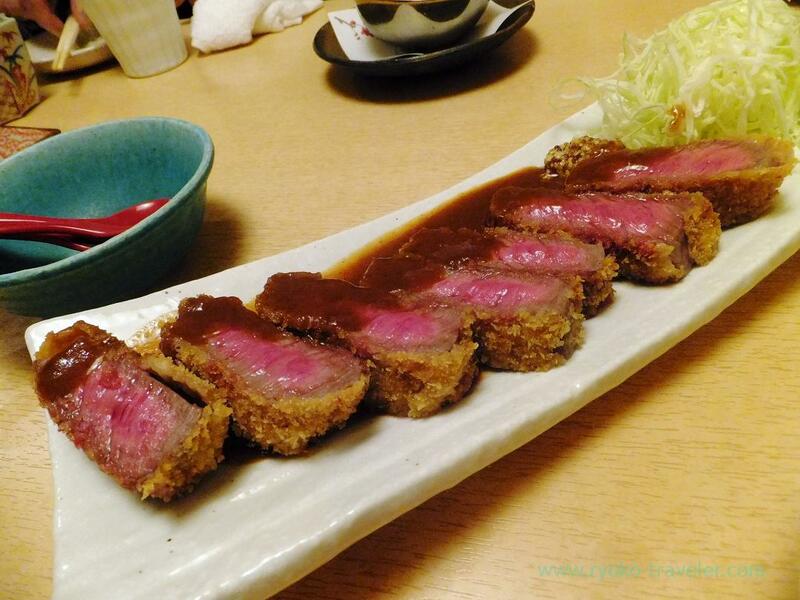 But I felt soy sauce with wasabi is better for the beef cutlet. BUT the beef was juicy and fat !!! 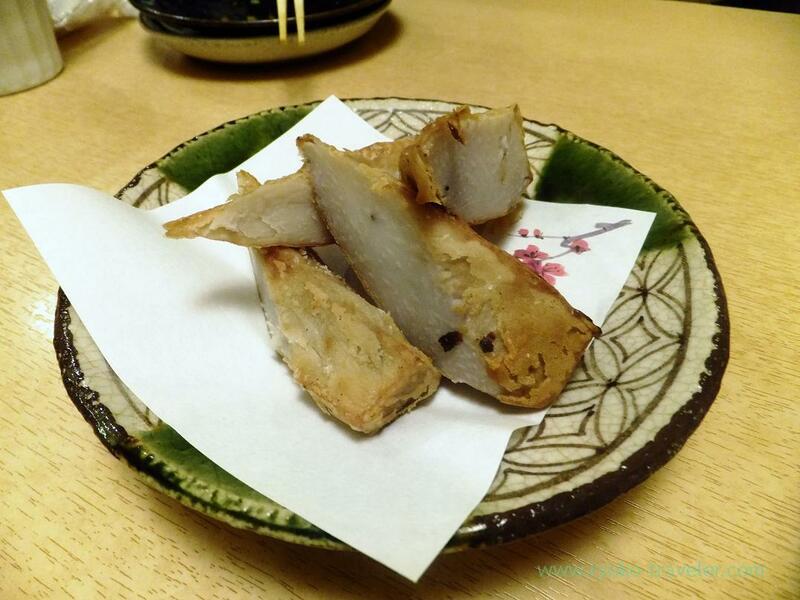 Ebi-imo is one kind of taro. 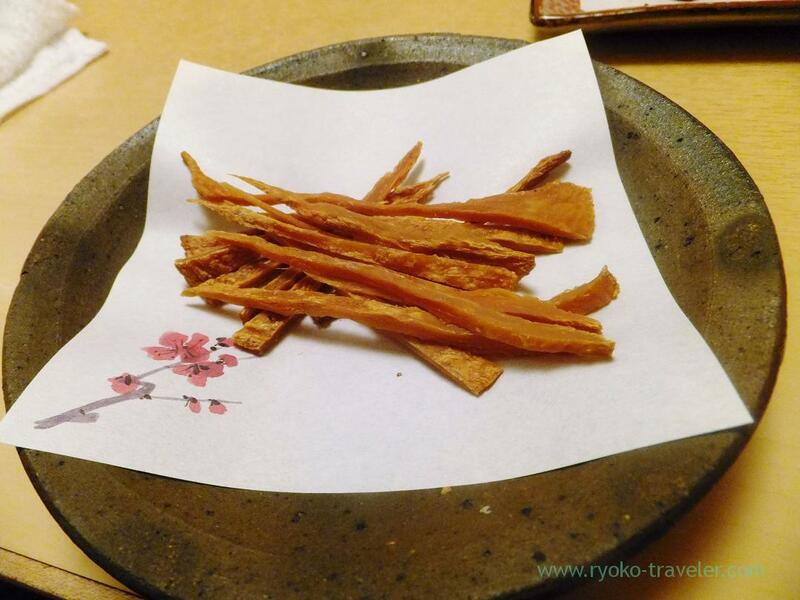 One kind of Kyoto vegetables (or Kyo-Yasai). “Ebi” means shrimp in Japanese. 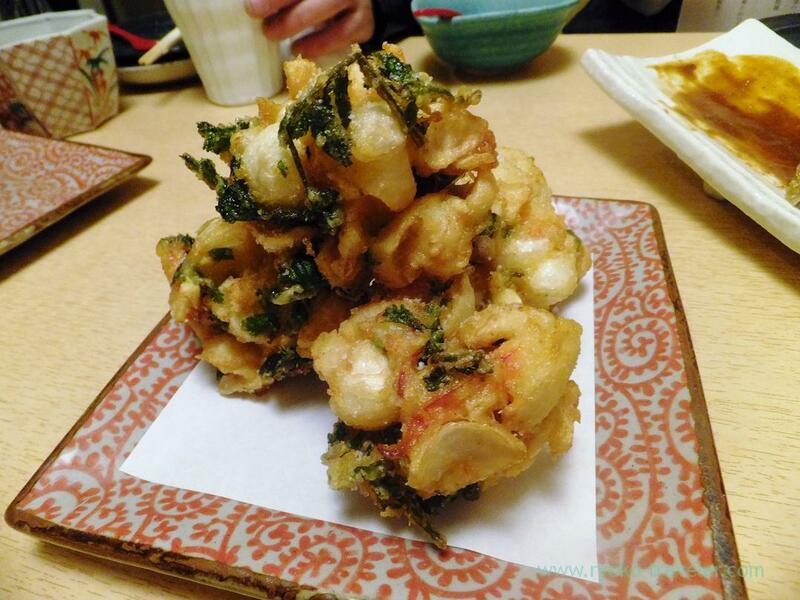 I heard that it is named “Ebi-imo” because it is similar to shrimps from its looking. …. I saw the whole ebi-imo at Tsukiji, but I didn’t think it is similar to shrimp. It didn’t have shrimps shape ! What is truth !? Well, apart from it, this had good texture and was delicious. And the bast food that I had that day was it. Dried sea cucumber’s ovary. I didn’t know it at all. It textured thick and sticky. It tasted very good. I’ll try to buy it on the internet soon. 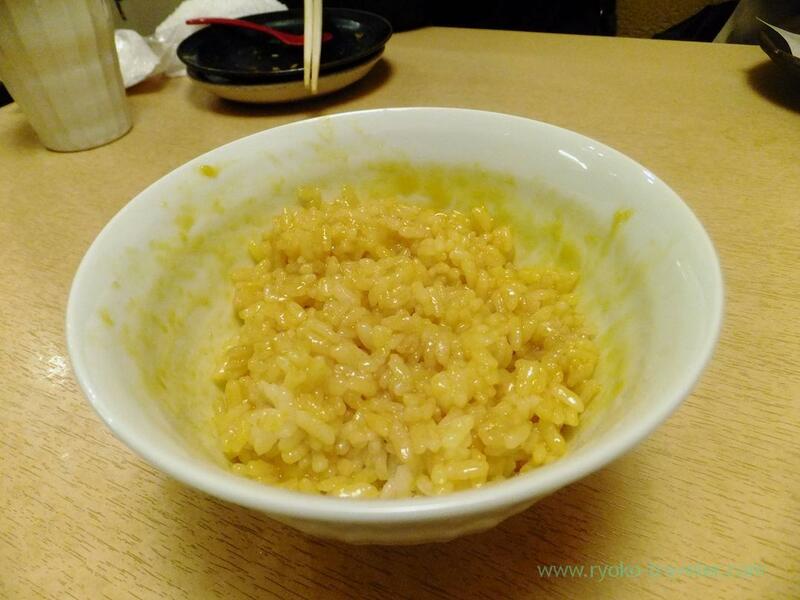 Speaking of ingredients of tamagokake gohan, egg, rice and soy sauce. That’s all But this shop’s tamagokake gohan also have much shredded Parmigiano Reggiano on it ! It had a egg, but we can’t see on this phtoo ! So much cheese ! The photo was taken after mixed altogether well. 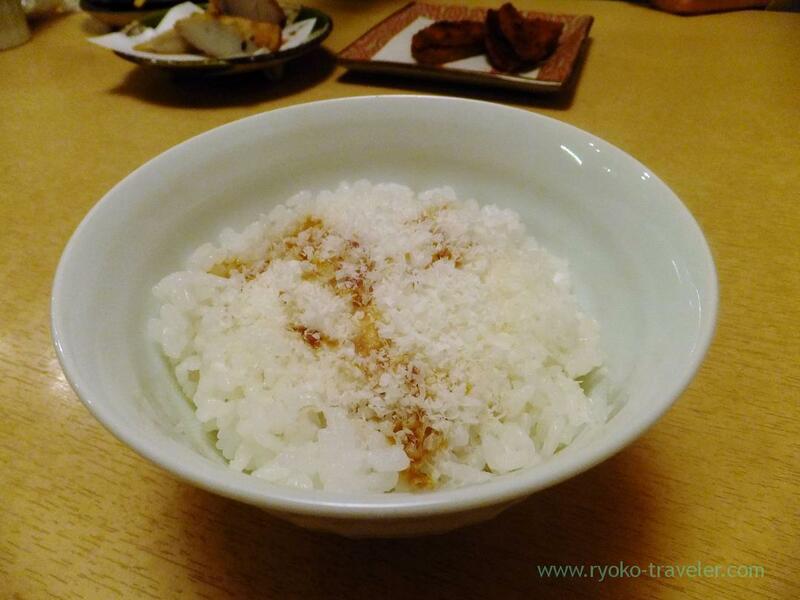 It looks like ordinary tamagokake gohan, but because of Parmigiano reggiano, it had rich taste. I want to try it at home, too. 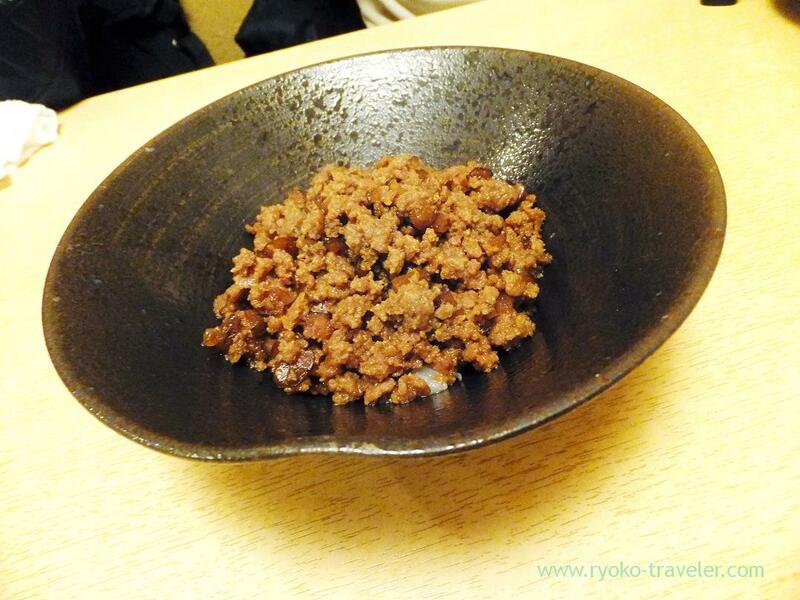 Minced chicken and burdock was seasoned with soy sauce and sugar. It went with rice well. And last, we finished our dinner time with the advertising food of Shimada is it. So much shredded mullet roe on the soft soba. We lightly mixed altogether and then ate. 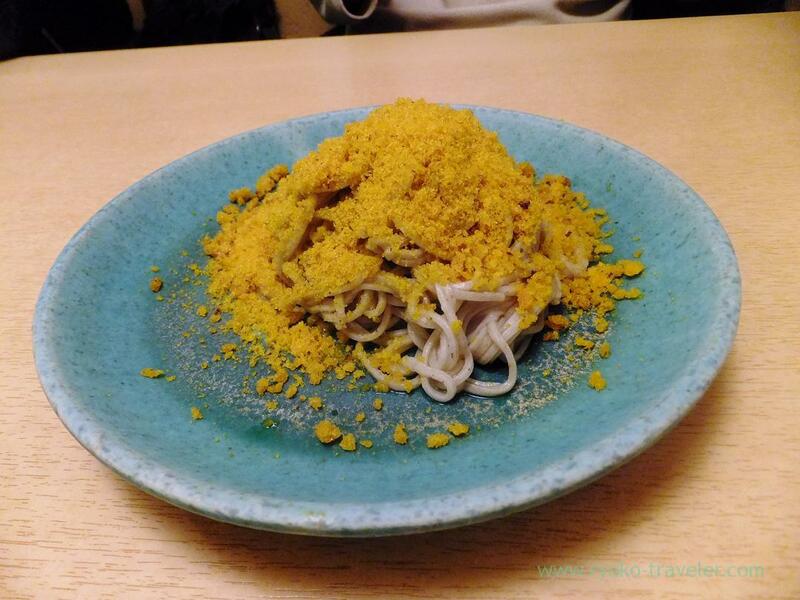 The soba itself didn’t have strong taste. Mullet roe seems to be leading actor on the dish. Awesome. I’ll go there again in a few days. 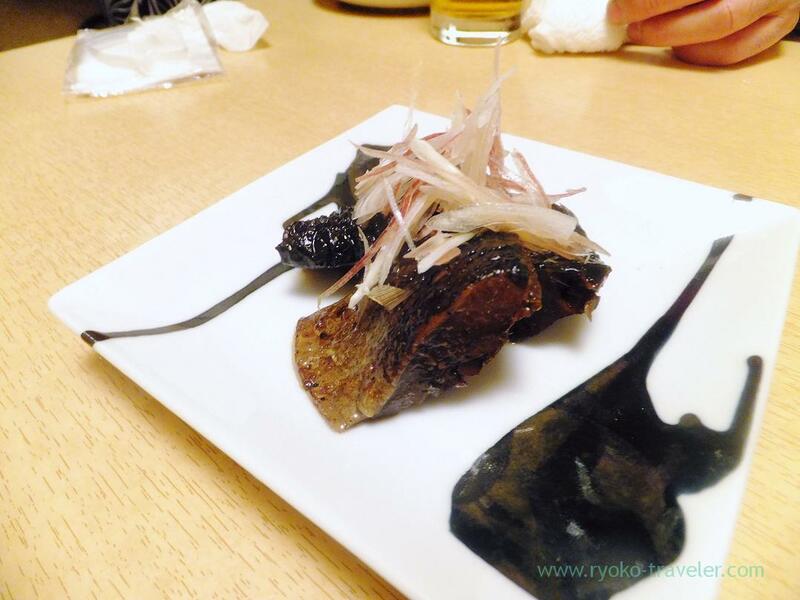 So, I’m looking forward to eating the soba with mullet roe and beef cutlet again !